The ultimate go-to bag for all kinds of trips, this 8-wheel spinner has a unique masculine style and the best configuration of pockets we’ve ever seen. Looking for a luxury carry-on that rolls in all directions, is built for business trips and puts your gear at your fingertips? Lat 56’s latest is part of its Urban Warrior collection, which is all about sturdy, lightweight, functional and great-looking luggage, primarily for business trips. Is the Road Warrior RW_02’s use of all-black, Military-spec moulded EVA foam on the front a tad masculine? Absolutely, and so is the dark red interior. In a commodity market where drab pastel nylon and bubble-like unisex designs rule, that’s a huge plus. Crucially, the Road Warrior RW_02’s dimensions fit Ryanair’s needs – the smallest around – measuring 55x35x20cm/21.5×13.5×7.5″ though it’s surprisingly lightweight at a mere 3.7kg. The wheels and extendable handle have not been skimped on; when it’s packed and being pulled along, the Road Warrior RW_02 doesn’t tip or bounce, even at a canter. Grab handles are supplied both top and side, too. As well as being water-resistant, the Road Warrior RW_02 has no sharp edges. No big deal? Tell that to TravGear’s hands, which got injured by the metallic parts of the last cabin bag we tried to shove into an overhead compartment. Thankfully, the Road Warrior RW_02’s soft and streamlined design is easy to manipulate. When you’re going through an airport, there are two things you need easy access to; liquids and documents. The first is catered for by the Road Warrior RW_02, which uniquely has a zipped top section beside the handle reserved especially for exactly that. There’s even a transparent bag inside awaiting your gels and creams. However, it does push into the main section, so it’s only usable if you haven’t overfilled-the inner compartment. And, wouldn’t you know it, an iPad Mini slips perfectly easily into this ‘liquids’ pocket, which is handy as you’re about to board a plane and need to thrust-out your in-flight entertainment before being separated from your bag. On the rear, there’s the usual zipped area to store a passport and boarding passes. Personally, I never do this, preferring to keep my documents on my person, and I often use this section to stuff an iPad or book. On the Road Warrior RW_02, it’s not really big enough for either. Pretty much the only other thing it doesn’t have is a glasses case, as featured by the Thule Crossover, though overall the Road Warrior boasts a much better design and build quality. ‘Taking less means you luggage has to do more’ reads the blurb for the Road Warrior RW_02, and that’s exactly what designer Kevin Fox has achieved with the surprisingly deep inner compartment. As well as being covered in luxuriously soft,dark red material, it uses every square centimetre to the full. On the inside of a lid is zip-around section clearly designed hold flat a shirt (or two). That’s a nice touch – too many cabin bags try to do too much with that area, and it gets messy. Another unique design flourish on the Road Warrior RW_02 are inside pockets on the long sides, with two separate compartments on the hinge-side having stretch fabric, and a longer pocket opposite great for storing documents and small accessories. Our only concern? No ‘wet pocket’ for a toothbrush and razor; TravGear sooo hates the wash-bag when travelling light. 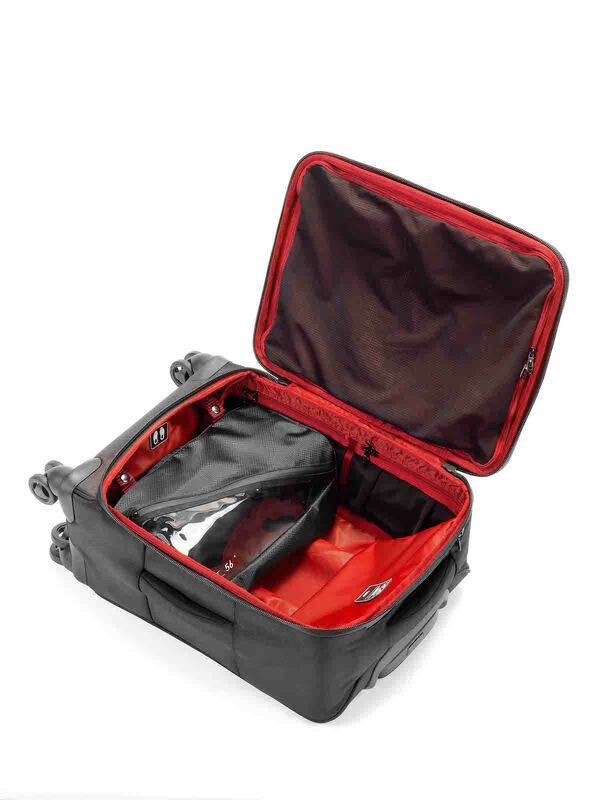 Does a cabin bag need a built-in shoe bag? Probably not, though it’s a nice idea. A zipped bag, it attaches to the lining with poppers, and folds over to sit on top of whatever is packed underneath. I guess it could double as a wash bag, or somewhere to stash a wet towel or swimmers prior to flying. It can also be removed, which is good thinking since different trips require different gear. The Road Warrior RW_02 is a stunning, streamlined cabin bag ideal for business trips and weekends away, but it’s sufficiently neutral to become a go-to bag for all kinds of travel. It steers clear from being a ‘gadget bag’ by swerving dedicated laptop and iPad compartments, concentrating instead on squeezing as much room as possible while adding some unique design flourishes that will appeal to all kinds of travellers. If there’s one things the Road Warrior RW_02 lacks, it’s a wet pocket for basic toiletries, while we’re not convinced the shoe bag is necessary. The pockets on the inside lining are awesome – really helpful for staying organised – while the easy access liquids compartment on the outside is genius (and double as a stash pocket for an iPad Mini or book). Lat 56’s Road Warrior RW_02 is a success, and well worth the price. To the airport!